Cynthia Haller is an expat, an interior designer, a mother, a DIY enthusiast, blogger at Home Cyn Home and a woman who follows her heart, and not what people tell her. 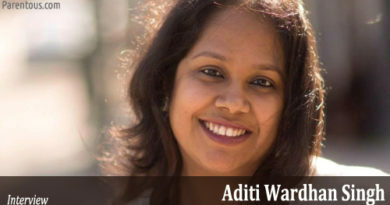 Her journey from Switzerland to India, making her own family here, balancing work and home, and in the midst of all this, finding time to indulge in her hobbies, is something that is frequently described as an ‘adventure’. We spoke to her about raising an active child, life in India and the deep rooted issues she has with bananas. Intrigued? 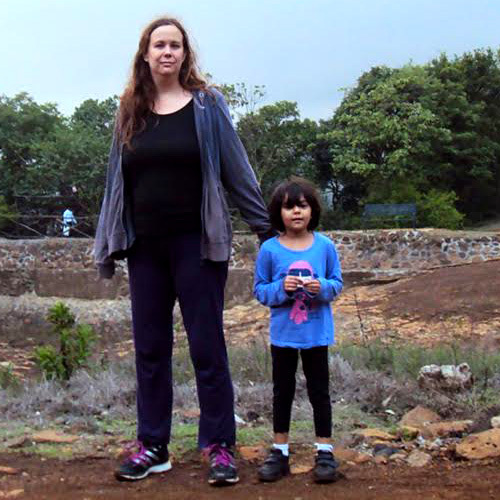 Read on to find out more about Cynthia’s sweet life in India. Q. 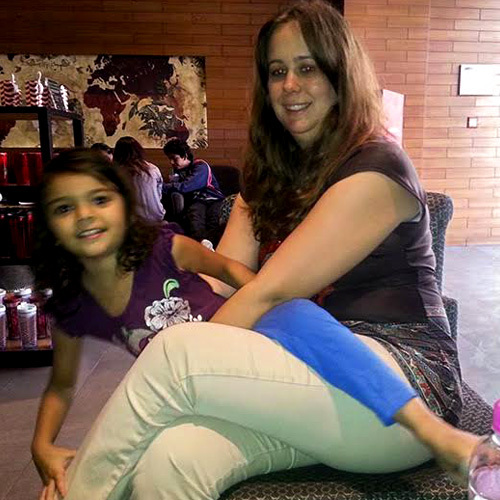 Tell us a little about Cynthia, the adventure seeker who followed her heart to India, the blogger and the mother. My name is Cynthia, I am from Switzerland, but have been living in India for almost 13 years. My husband is Indian and we currently live in Mumbai with our nearly 7 years old daughter Ishita, our Labrador Jasmine, and our cat, Mittens. I am an artist, blogger, I write the blog “Home Cyn Home”, I have been writing this blog for 12 years, but not always under that name. Last but not the least, I am a HUGE tea lover. I like my tea without milk or sugar, but not necessary plain old black. I have about 10 different kind of teas and herbal infusions in my cupboards right now, and it’s nothing, once upon a time in Switzerland I had over 20 varieties of tea at home. Q. What was it like moving from Switzerland to India? Did you experience a culture shock? I think all expats do experience culture shock, no matter where they are from or where they are moving to. My biggest initial shock was the food. I knew not to expect it to be all the same, and I love tasting new cuisines all the time, but realized how deep rooted food is to one culture once I was taken out of my own. I was used to tasty, crunchy, fresh bread for example, and suddenly, I was in a world where all there was was the bland, mushy and crumbly sliced bread (which we call toast bread in Switzerland). It was before sourdough, baguettes and multi grain bread were much of a thing in India. Then there was the meal timing, in Switzerland breakfast is the instant you jump out of bed, lunch is at noon and dinner at 7 pm. Waiting until 10 pm for dinner is something I still can’t do 13 years down the line, my digestive system won’t take it lying down. Q. From the overcharging rickshaw driver who couldn’t get the destination right in Chennai, to the Aunty/Uncle frenzy and being threatened with an acid attack because your dog pooped on the street, you’ve come a long way. Can you recount for us an experience from back then that still cracks you up? When we were living in Bangalore, in a still fondly remembered roof top flat with a huge terrace, I had a nosy aunty neighbor whose house was taller than ours and allowed her to spy on us. When I was pregnant, I enjoyed being outdoors as much as possible, and still enjoyed watering my plants. At one point, I was about 7-8 months pregnant, in my maternity t-shirt and shorts, watering my plants. Aunty was out for her spying session as usual and she felt the need to scold me. I was apparently not allowed to step outside while so obviously pregnant and I should certainly not be watering my plants. She even blamed my maid for not taking better care of me and asked me to hire another one. I told her, that no, I was fine, and my doctor asked me to stay as active as possible until the very end. I also added that she was free not to look if it bothered her so much. I think in the 5 years that we lived in that flat we scandalized her more than once, LOL! Q. What was the transition from interior decorator to translator to full-time mom like? Were there challenges that seemed insurmountable along the way? I think life is a series of challenges, with or without having children. I tend to move with the flow (most of the time). I think the hardest when I became a mom was to accept that my priorities were forever changed. There was also a struggle with this ‘All or nothing’ attitude people want you to have about parenting. It’s easy to lose your own identity if you go down that path. The way I see it, it is totally possible to be a mother AND still be your own person. And I think it is important for all new moms to realize that as important as a child is, it doesn’t have to define you as a whole. I’m more than just Ishita’s mom. Q. We’d love to know a little about your family? What’s your daughter, Ishita like? Ishita is a ball of hyperactivity, I think that is the best way to describe her. She has always been the one to want to be on the go and in charge of her own life. It started from the moment she was born and HATED being swaddled. I got lectured by the nurses about how babies feel safer and happier being swaddled. All the while, my not even a day old daughter was screaming and trying her best to kick her way out of the swaddling blanket. She discovered mobility at 7 months, crawling, but by 10 months she was confidently walking on her own, and she started climbing on everything she could climb on at 11 months of age. As you can imagine, she kept me on my toes all along. She seems to have inherited my strong will and determination to do things my own way. Clearly the apple doesn’t fall far from the tree. Q. As a child, did you dream about being a mother? Has reality been anything like the dream? Yes, like all girls my age I dreamt about it. I even still remember proudly telling my mom I would have 14 kids when I grew up. 14!!!!!! What was I thinking? Needless to say I am happy having just one now, and that like all little girls, I had no idea how tough being a mother was. Q. With Ishita going through her prime learning and reasoning years, what are the values you feel need to be instilled in her to brave the world? The most important things I want her to learn are to be independent and to be able to come up with her own conclusions. I want her to carve her own path in life and not rely on other people to tell her what to do, who to be and impose arbitrary limitations on her. These are the exact gifts my parents bestowed upon me, and this has taken me places. I want the same for my daughter. Q. Popular culture portrays a vast difference between Western and Indian parenting styles. Is there any truth to this? If yes, does this debate surface in your intercultural household? How do you and your husband find common ground? I don’t remember it having been as much a problem in our intercultural family as it has been with outsiders. Outsiders definitely think I am weird. In European cultures kids have set bedtimes and are expected to eat what is on their plate at the dining table, without any negotiations possible. Those are rules I have enforced. Ishita is in bed by 7.30 or 8pm at the latest and she has no problem with it. One thing that has always amazed my Indian parent friends was the fact Ishita was feeding herself from very early. I pretty much started leaving her in charge of the spoon or her own hands at 7 months of age. Another thing I have never been afraid to do is enforcing a ‘every act has consequences’ policy. So when she did push a boundary beyond the spectrum of acceptable behavior, privileges were taken away. Wait! I still do that! Q. Being a mother comes with the entire package – unconditional love and never-ending worry. Does the current scenario of the world and children’s exposure to it through the news, blogs and the internet keep you up at night? Ishita is turning 7 soon, so I am not yet worried about social media, but I have already started keeping an eye on what she watches on TV or how much YouTube she is exposed to. Since my parenting goal is to equip her with the ability to form her own judgment and take what other people say with a pinch of salt, I hope she will in time learn to question the entire content of the Internet. She already has a strong sense of right and wrong at her age, I think the best I can do is nurture it. Q. They say being a full-time mom is the hardest yet most fulfilling job in the world. What’s your take on this? The cliché is true. It is the hardest yet most fulfilling job in the world. But in the end, it has to stay a job, a very important one, but still a job. Being a mom is a title, but that is not ALL that I am, and I think this reasoning has made all the difference for me. Q. What would you say have been your biggest successes as a parent? How about relocating 4 times with a child under the age of 4? It’s a hard thing to do, harder than anything else I’ve done since being a parent. 3 of these moves were across the country, but all 4 involved a lot of boxes, packing, planning, unpacking and soothing a small child who just didn’t get why all her toys and furniture were gone. On one move, she even totally freaked out at the idea of sleeping on air mattresses for 3 nights. When you are dead tired and on the brink of losing your sanity, this is really hard to cope with. But we did! Q. How did you stumble upon blogging? What inspired you to start ‘Cyn’s adventures in India’, now ‘Home Cyn Home’? Back in the days, I was a “Community Leader” (CL) on the now defunct ivillage.com. I was in charge of both the Allergies and Asthma board and the Expatriate board (they were online forums). One fellow CL in one of our “Community leaders message boards” pointed out that my life in India was really sounding like ‘such an adventure’ and urged me to start a blog. This was back in 2004, and I was not very inspired with names, so I simply named it “Cyn’s Adventure in India”. Years passed, and I found myself blogging less and less about the typical expat stuff and more about what I liked: DIY, food and home décor. Unlike the first blog title, “Home Cyn Home” has been the fruit of a lot of thinking. India became home over the years, and as an interior decorator and all-things-crafty enthusiast I wanted my blog name to reflect just that. Home Cyn Home is a wordplay on “Home Sweet Home”. I wanted “Cyn” to still be in the blog name, but I wanted it to be about home too. Q. How do you make the time to blog in between managing a household and caring for your little girl? It’s easier now that she is almost 7 and in school full time. That said, I knew I could never give up my blog from the start. I love my blog, I love the outlet for emotion it provides me. I did keep it in my spare time all along. We all have spare time, it’s up to each of us to fill it with things that make us happy. My blog has always been a happy place for me to be. 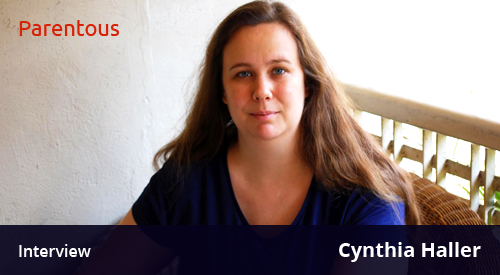 Q. We’re curious to know, what does a typical day in the life of Cynthia Haller look like? 1.) The school day: I wake up at 6, prepare the tiffins and get Ishita out of bed. She is in charge of getting her breakfast ready and dressing herself for school while I prepare the tiffin and get myself ready to step out and drop her to school. Until last April, it meant putting her on the school bus by 7.30 am but that routine will change soon. Once she is in school, I spend time with my husband before he heads for office, then I either go for a walk, or start working on something blog related. And there is a lot to it, as this blog post suggests. I keep lunch very simple since I am the only one at home then, it’s usually leftovers or a salad. I then continue working on my blog or crafts projects until around 3 pm. Ishita comes back home then. Then we either stay home and read books or play games, or we go out to play in the garden or go to a playdate until 6.30 pm. This marks the start of the evening routine. Ishita takes a shower then while I fix dinner and then after dinner is done, she is allowed to watch her favourite cartoon before heading to bed. I then spend the rest of the evening relaxing, watching a movie, reading a book and spending time with my husband. I am usually in bed by 10 pm. 2.) Summer vacation time: I wake up at 6.30 because that is when Ishita is up. I usually check my emails and write my to-do list for the day then, Ishita watches TV while I sort out the day ahead. Then we have a quick breakfast of cereals and fruits before she goes to her morning Gymnastic class, and I head to a coffee place to write. We are home by 11.30am and I fix a quick lunch. Since Ishita is a highly extroverted child, she usually spends her afternoon with friends, at their place, or at mine. I freelance as an expat consultant and also do a little website building on the side, so I spend that time working. By 5 pm we are outdoors, until 7 pm at which point I initiate the ‘evening routine’ because Ishita wakes up early and is still dead tired by 8 pm. The rest of the evening goes the same way as when it is a school night. Q. One glance at your blog, and it’s obvious that you’re the Queen of DIYs. Simple and doable, your DIYs are riots of colour and creativity and are very well received by craft junkies and newbies alike. What importance does art hold in your life? It holds a HUGE space in my life, I have always been the creative type. Unlike most kids I didn’t just settle for scribbling on walls, nope! I used glue and paper, and even my mom’s makeup to do the deed! As a child I joined a lot of activity classes, the art period in school was my favourite. As a teen I took a pottery and ceramic class, was an art major in High School and later did an apprenticeship as a decorator. I constantly think of things to paint, upcycle, transform or create. The art supply shop is my favourite place to be (along with book shops). Q. We enjoy reading about the DIY projects you and Ishita do together. 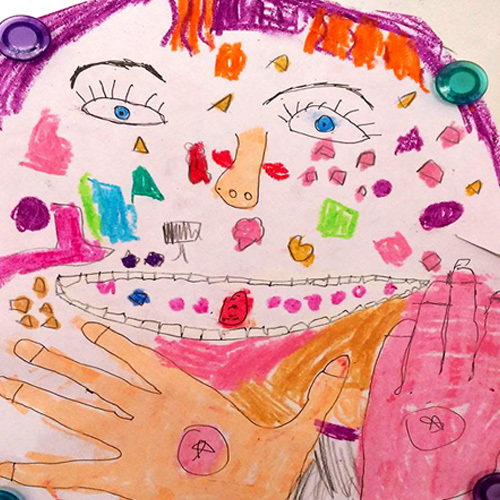 How does including her in your projects help strengthen your mother-daughter bond? While Ishita has inherited my strong will and drive, she isn’t as passionate about craft projects as I am. She enjoys doing creative stuff, but if it can’t be done in 5 minutes flat, she usually loses interest. The best way to have her attempt something creative is to leave a stack of paper and some crayons around for her to play with at will. She doesn’t care much about structured art activities. I respect this individualistic trait so I really let her do what she wants while I work on my own project. What matters is that she sees me doing what I want. Q. Oh, and the food on your blog makes our tummies jump for joy! Tell us about your love for cooking and do share with us a culinary experiment that didn’t turn out quite as expected. There have been quite a few. The few that are the most imprinted in my memory ALL involve bananas. There was that Pinterest recipe for ‘1 ingredient banana ice cream’. It involved freezing chunks of banana and then blitzing them to an icy puree in the ‘mixie’. I broke the first mixie jar doing it. I transferred the content to another jar, and it turned into a sticky goo and eventually broke the second jar AND the mixie! Then there was the recipe for flour free banana pancakes, I can’t remember what were the other ingredients. What I remember, is that the banana caramelized in the pan, created a lot of smoke and the whole kitchen reeked of burnt banana for hours afterwards. At this point, I am convinced bananas are evil. Q. We’ve read about your initial struggles when you first moved to India. 13 years down the line, how is expat life treating you? It’s treating me very well. I am not even sure I totally qualify as an expat, I’ve been around too long for that. I guess I’ll always be an expat, but it doesn’t really feel that way anymore. I see the past 13 years as a journey from early adulthood into…well I am not sure into what really! The point is I did all of my ‘figuring out this grown up gig’ thing in India. I have no point of reference left in Switzerland. I only lived 2.5 years on my own in Geneva as an ‘adult’. Q. You’ve been blogging for almost 12 years; that’s eons in blogging years! Any memories, both sweet and sour, and/or regrets that you’d like to share with our readers? I don’t have regrets, I am not the type to dwell in the past long enough to have regrets. As far as blogging goes, I never imagined this blog would have taken me as far as it has. I made incredible discoveries, forged amazing friendships, worked on great projects. And, yes I had to deal with internet trolls as well. Q. If the many loyal readers you’ve managed to cast a spell on are anything to go by, you’ve obviously mastered the art of blogging. What do your husband and daughter think of ‘Home Cyn Home’? I don’t think my daughter realizes what a blog is, she is still amazed that the pictures I took with my phone or the DSLR show up on the computer. My husband is proud, and he usually introduces me as a blogger when his friends ask what I do. He supports me 100% with it, and he is my biggest fan when it comes to all the artsy stuff around the home as well. Q. As a mother, do you draw motherhood inspiration from the women in your life or women role models? If yes, how have they inspired you to be the mother you are? That is a very difficult question to answer. I think if there was to be a model, that would be my mom, but to be frank, I am really a self made person. I have always been that girl who refused to bend to any standard, and always carved my own path in life. So much so that I applied this same logic to parenting. Q. How important do you believe it is for mothers everywhere to take up a form of expression – be it art, crafts, music, writing, dance, etc.? VERY IMPORTANT! You do not stop being a person when you become a mother. You need to keep on having hobbies and passions of your own. I believe living exclusively through your children with no other passions and interests on the side is destructive in the long run. Q. Considering all the beautiful craftsy revamping projects we see on your blog, we can only imagine how gorgeous your home must be! Is there any one project that is very close to your heart; any one piece that you’ve created that you feel your home would be incomplete without? 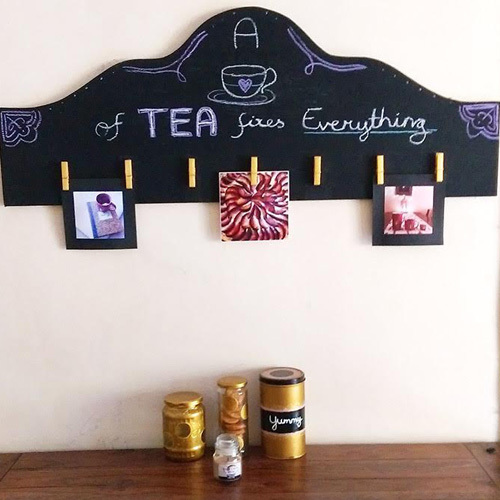 I think the one I could not bear to no longer have is a project I created only recently, the ‘Black board photo display‘. It is the best way to display our pictures and create seasonal vignettes in the living room. Q. Do you have any tips/advice for mothers who want to start/continue blogging or take up a hobby but feel like they don’t have the time or energy to do it while raising a child? We all have time, sadly, society wants us to believe we can be good mothers only if we devote every single nanosecond of our existence to our babies. In the long run, I think it is a destructive thing and you risk losing yourself. If you have a hobby keep on having it, even after having kids. Even if for a while you can only devote a few hours a week to it, it is better than nothing at all. That hobby might turn out to be the thing that will stop you from going insane in the long run, so it is worth keeping it. Q. What have you learnt from your daughter? And what have you discovered about yourself after becoming a parent? I have learnt that that my patience can be stretched further than I thought (just kidding, well, almost…). I have also learnt that unconditional love for your children is what makes you tolerate being peed on, pooped on, vomited on and being bitten at times. It is also the reason why you wake up in the middle of the night to chase monsters away because your child asked you to, or wake up before sunrise when you aren’t even a morning person. The things we do for love! So that was Cynthia’s candid interview about what makes her tick which gave us a peek into her wonderful life. We’d love to hear what you though about the interview and what you loved most in the comments section below!